Petunia is definitely an independent walker now. She toddles around the house with a satisfied smile on her face, until she sees me, at which point she puts her arms up and demands to be picked up. She still likes to push Pumpkin's baby stroller around, though. Tonight, she was circling through the house, walking from Pumpkin's room, down the hall, and out into the living room, then back. Each time, as she left Pumpkin's room, she paused in the doorway and grinned and waved "bye" at me and Pumpkin. And when she came back in, she grinned again, and waved "hi". Ever since Christmas, Pumpkin has been wrapping gifts for everyone in the family. She'll pick some book or toy, find a doll or baby blanket, and wrap it up. She does a surprisingly good job. Apparently, the good wrapping gene skips a generation- my Mom has it; I do not. Tonight, Pumpkin decided to wrap up a box of flash cards for Petunia's "birthday". She made her a cake out of lego, and then had us all sing "Happy Birthday". Just as we got started, she stopped us and said "No! In Chinese!" and led off again, in Chinese. Then she ran down to her room with the flash cards to wrap them. Petunia came toddling in with the stroller, and Pumpkin gave her the gift. Petunia plays along with this game better than any of us- she gets a genuine smile, and eagerly takes her "gift" to unwrap. This time, though, she was confused. She couldn't walk down the hall with her gift AND the stroller. Pumpkin saw this, and said "Don't worry, baby. I'll carry your gift for you." And they set off down the hall together. They are arranged in order of size. 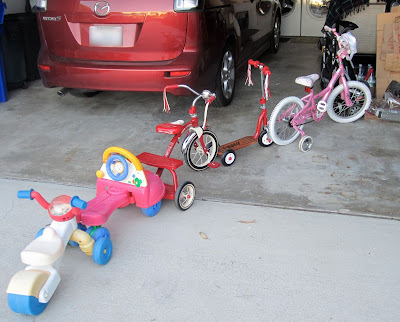 You can't see Daddy's scooter, because it wouldn't stand up, but it is at the front, because it is tallest. 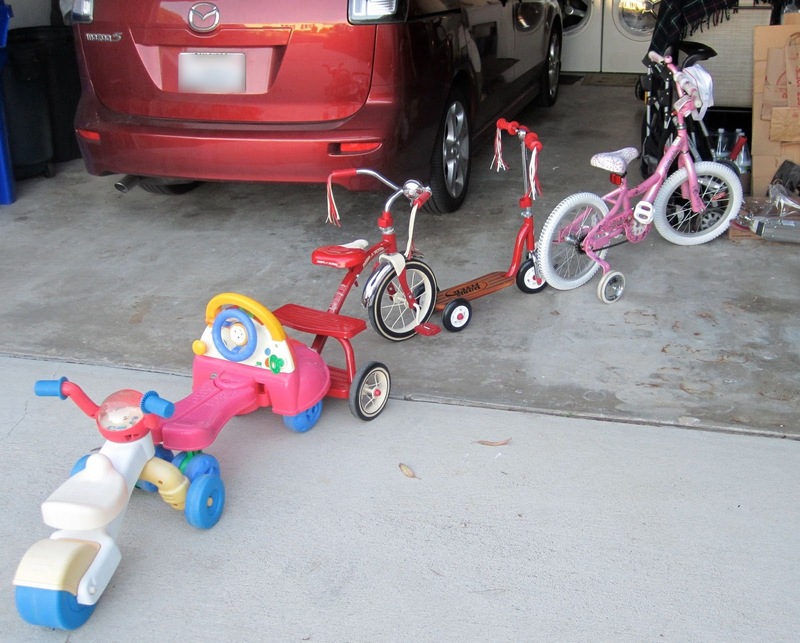 I guess I should be glad that she didn't make me drag out Daddy's bike. We made chocolate chip cookies this afternoon. Pumpkin enjoys helping me measure, but runs away when I turn on the mixer. She says it hurts her ears. She said the same thing about the hair dryer this morning, and went and hid behind the rocking chair in Petunia's room. She shrieked with delight when I came in and found her. Pumpkin also helped me make Pumpkin-Parmesan scones for dinner. Again, she helped me measure ingredients, and she helped me mix. She even helped me knead the dough. Then I cut the scones, and she helped me brush egg white on the tops and sprinkle on the parmesan cheese. She picked out one to be for her and one to be for Petunia, then helped me put the pumpkin seeds on the rest. She was excited to eat "her" scone with dinner. Unfortunately, I forgot to tell Hubby that the scones had assigned owners, and he gave Pumpkin's scone to Petunia. A massive meltdown ensued. Hubby didn't understand what the big deal was, so his reaction to all of this just made things worse. I did understand the problem- she'd selected the scones for her and Petunia carefully, and was really looking forward to having the one she'd picked. Still, it took me two trips to Pumpkin's room to get her to come back to the table. She finally did, and ate the half of her scone that Petunia hadn't eaten and a little bit of her soup. When Petunia wants to nurse from the other side after finishing on the first side (something that only seems to happen in the middle of the night, strangely enough), she signs "more" in the not quite correct way that most toddlers seem to do it- one palm open, pointing to it with the pointer finger of her other hand. But because she has immediately stuck her thumb back in her mouth after releasing her latch, she signs it right in front of her nose. I think this is cute, even in the middle of the night. Pumpkin had cheese (and a chocolate chip cookie) for snack tonight. She lined up her four slices of cheese, because she likes to line things up (see above). After she'd eaten three slices, she picked up the remaining slice and sang "the cheese stands alone, the cheese stands alone, hi-ho-a-derry-o, the cheese stands alone". This post was brought to you by the letter "I" and the number "2". And my bad memory and fear that I will forget all of the best parts. Aw, cute! My niece, poppy, is exactly the same about the mixer and had to hide behind the sofa with my mum while I was making cakes when I was there! Oh, have I not sent you my cheating chocolate chip cookie recipe? (Not MINE mine, just the one I use.) It uses oil, not butter, so no mixer; and you bake in logs and cut after. Super quick and so easy...we make this almost every Thursday and AM pretty much does it himself. My internet is totally not cooperating right now--when it does I will send you the link. So adorable! What a lovely collection of snapshots of extreme cuteness. Cute stories! Tate signed more the same way. Universal toddler language I guess. Love how sweet Pumpkin is with Petunia. Oooh - my 14-month-old has been doing that pointing at the palm thing. I couldn't work out what sign it could be, but maybe it is "more". Thanks! You know how I love to hear the cute kids stories! All of these were adorable, and I'm smiling still.